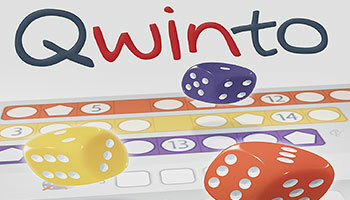 Players in Qwinto all play at the same time, with everyone trying to fill the rows on their scoresheets with numbers as quickly - and as highly - as possible in order to score the most points. The game continues until someone has filled two rows on their scoresheet or someone has tallied four misthrows. Players then tally their points: For each completed column on their scoresheet, a player scores points equal to the number in that column's pentagon. For each completed row on their scoresheet, a player scores points equal to the rightmost number in that row. For each incomplete row on their scoresheet, a player scores one point per number in that row. For each misthrow, a player loses five points. Whoever has the highest sum wins! Players try to write down as many numbers as possible in the three differently colored rows on their respective score sheet. If you manage to enter a number in all the fields of a colored row, you'll score even more points for the row. There are also lucrative bonus points you can score for entering a number in each field of a column made up of 3 fields.